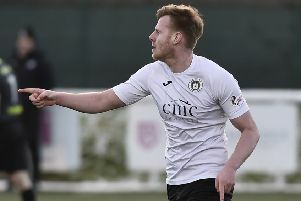 Edinburgh City boss James McDonaugh has challenged Calum Antell to prove he is the club’s No.1 goalkeeper. The 26-year-old Welshman’s stoppage-time error denied City maximum points in a topsy-turvy affair at Borough Briggs on Saturday. 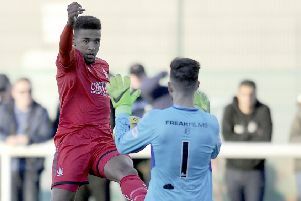 Hosts Elgin City had raced into a 2-0 lead at the interval courtesy of a Kane Hester double only for McDonaugh’s men to turn the game on its head in the second 45. Allan Smith started the comeback ten minutes after the restart before Scott Shepherd restored parity 14 minutes later. And, after Blair Henderson had given the Citizens the lead in the 88th minute, City were on course for an unlikely three points. However, Antell’s error in the 93rd minute allowed Stephen Bronsky to rescue a point for the Moray-based outfit. City are, though, a point better off at the top of Ladbrokes League Two after Peterhead’s 3-0 defeat at Annan. “It’s a really bad mistake that has cost us two points, to be honest,” McDonaugh said. “Calum has made the wrong decision. He should’ve caught the ball but elected to punch it and he failed to execute the punch which saw the ball fall to their player to scramble it home. “Calum put his hands up afterwards – he couldn’t really say anything else. It wasn’t debatable. He’s been brilliant for us all season but there comes a point when you have to take the rough with the smooth. “We lack a bit of competition in that area so he’s maybe a bit fortunate in that respect. We’ve got young Fraser Morton, who is a promising goalkeeper but it’s a big ask for him to come in and play in a side that is top of the league. I want Calum to go and show me he is No.1. On the game itself, McDonaugh added: “I thought over the course of the 90 minutes we played well. There was just that ten-minute spell where we never dealt with their movement and they’ve got their goals.